I find myself contemplating the situation of employees in the American world of work. When an employee accepts a new position, they must willingly put their life on hold to manage their career. They must be willing to voluntarily give up their entire day, work from eight to five or later, at a frantic pace with limited breaks and abbreviated lunches, delay vacations to finish that important last minute special project for the boss, miss tucking the kids into bed while burning the midnight oil, frequently eating at their desk, arriving home from a business trip at midnight only to be expected back to work at eight in the morning. All these daily sacrifices for a paycheck and benefits with little flexibility. While running on this corporate treadmill we try to forget our employer could fire us at any time for any reason and without notice. On average, Americans jump on and off this treadmill at least three times during their working career. There is coming a day, however, when people in our generation will find all those years of fast-paced sacrifice will have been wasted because their retirement savings will be inadequate, along with the funds to pay for medical insurance in their twilight years. This hasn’t always been the future of working Americans. A great deal has changed since my father began his career in the 1940’s. My father started working for an oil company when he was eighteen. Working a variety of labor jobs for a few years until he landed a job as an oil gauger working in a small shack nestled inside the refinery amongst the steam, pipelines, refining units, petroleum storage tanks and terribly nauseous smells. Forty-four years he worked for that company as an hourly paid employee in the same location. For a man with a high school education and a solid work ethic, he was the beneficiary of lifetime employment. His non-union company provided the best in salary, benefits and a fully-funded retirement plan. Now that my dad has been deceased for twenty years, my mother still remains the recipient of my father’s retirement income and wonderful health benefits provided by his employer. Except for a few executives at the top of today’s American corporations, these retiree benefits are largely extinct. I am not advocating we return to the days of lifetime employment; just emphasizing those days are gone. 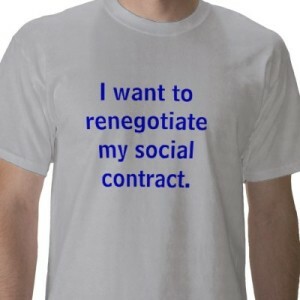 The corporate social contract is officially over. That is why I contemplate the current situation in today’s world of work. There needs to be a sweeping change to re-balance the scales. Most employers still expect undying loyalty and sacrifice yet they are unwilling to provide the benefits. Therefore, I propose we create a new social contract: complete flexibility and free agency for employees in exchange for at-will employment and limited benefits. What do you think? Very interesting post – hopefully as the economy gets better things will revert back to how they used to be.